What is a flexible no-wire partial denture? 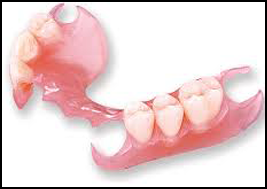 Our flexible no-wire partial dentures consist of replacement teeth attached to pink or gum-colored plastic bases. Your dentist will design a partial denture for you based on your individual and personal condition. In most cases, a removable partial denture is made to attach to your natural teeth with devices called precision attachments, which are generally more aesthetically pleasing than metal clasps. What do I do after my partial denture is delivered? Over time, adjusting the denture may be necessary. As you age, your mouth naturally changes, which can affect the fit of the denture. Your bone and gum ridges can recede or shrink, resulting in a poorly fitting denture. Clean your dentures daily by thoroughly rinsing off loose food particles. Moisten the brush and apply the denture cleaner. Brush all denture surfaces gently to avoid damaging the plastic or bending the attachments. In the beginning, your new partial denture may feel awkward or bulky. This is normal, and you will eventually become accustomed to wearing it. Inserting and removing the partial denture will require some practice. Follow all instructions given by your dentist. Your denture should fit into place with relative ease. Never force the partial denture into position by biting down. This could bend or break the clasps.